This thread is the place for General Discussion about Theme Park Apprentice 7, including responses to judging critiques, and is open to anyone participating in TPA7 in any way, including TPI readers who are just enjoying watching the competition. Do NOT post challenge proposals or challenge specific questions here- post them in the Challenge Thread. Do NOT post questions about rules, regulations or technical questions here- post them in the Competition Handbook thread. This is a request from the judges. Please, PLEASE don't wait until 11:59 p.m. site time on the last day to post your proposal. If you have it ready, and you know it is a winner, post it. Somebody has to go first, and it might as well be the best proposal- yours, right? If everyone waits for the last minute you might have trouble getting it posted in time, plus that forces the judges to have to do a marathon reading session of at least ten proposals (I say at least because we still can have some late entries, and NONE of the ten current competitors are going to suddenly disappear or drop out, ARE YOU?! :+) We want to have time to read them all carefully and to write constructive commentary about each proposal. Now if you haven't already started, get to work, get creative, and get ready for a great TPA7 Competition! I've responded in the other thread, but its just a response to have a response. We are discussing it and should have an answer for you soon. Good question. I've contacted the other judges with my opinion and one of them should hopefully post the final answer in here soon. Sorry for the hold-up this might cause. Hopefully this is early enough in the challenge not to cause a problem with you proposals getting done in a timely manner. It might not be a bad idea to look at the future proposals and see if anyone notices other issues that need to be addressed, so that we can get them decided ahead of time. All I can say is... I hope it's a winner! Great, Tyler! I look forward to reading it tomorrow night. My Proposal is in! I'm looking forward to competing for the first time! Glad to see you competing, DPCC. In case you weren't aware, your HTML code is not properly formatted. If you go back and remove all the asterisks it should display as desired. I won't judge you down for that little snafu. I missed it in the "handbook" also. I would encourage all other competitors who will be using those HTML codes to be very careful and be sure you have them in correctly. They can cause havoc if just one mistake is made. Well, it's official.. I've posted my attraction.. I'm rushed for time next week, so I'm not sure if I can get mine in next week if I'm even still in the competition. That was pretty good for a first time posting. It sounds like you had most of the ride pretty well thought through, but since there are many different decision points, it made it tough to write. Since it is VR, more or less like mine is, it might have worked a little better if you had given an overview of the storyline instead of trying a scene by scene explanation. Tyler, until you have been officially eliminated you remain part of the competition. Don't count yourself out too early, as with a majority of competitors left to post it is very difficult to guess your placement. Also, keep confidence in your work. I've seen proposals that I thought were sure losers wind up near the top of the rankings, and have seen judges rank something I'd consider a winner as last place. If you are going to be busy next week, I suggest you take a look at the Challenge Schedule in the Competitor's Handbook and start working on next week's challenge. The description should be enough to form an outline, then you can go back, fill in the details, and make tweaks as necessary based on the exact requirements. Jeff's advice is pretty much right on, though I would also suggest taking a look at Knott's Calico Mine Ride and Timber Mountain Log Ride as well since they recently received major refurbishments and Cedar Fair has said they would like to work with Garner Holt in the future. Lastly, we really don't want to see you drop, so if it comes down to the wire and there is absolutely no way you'll be able to submit something, review the rules for the Real Life Pass in the Competitor's Handbook. This is a new feature for this season in order to help prevent drops and may be used ONE time during the season. It does come with a penalty, but will allow you to continue in the competition without submitting a proposal for a challenge. Looking ahead at the 2nd challenge, I am having some concerns. What direction is Cedar Fair heading in with their dark rides? Boo Blasters and Guardians are not very good, and although Voyage to Iron Reef is very good, it is a standard shooter ride. Cedar Fair inherited two legendary dark rides at Knotts with the log flume and mine train and upgraded them very well, but Cedar Fair is not on par with Disney or Universal, so proposing a Disney or Universal quality dark ride may not be a good idea. Or is it? Also, what would be more appropriate for Cedar Fair, a dark ride with more practical sets or more screen 3D based? Please help. That's a very good point, Keith. Apparently if you theme it too well you will be accused of making a Universal or Disney quality attraction and get marked down for it. What is the proposal going to look like? Possible example: My queue and intro video is going to be themed to __________ and during the ride, you will be randomly shooting at: ____________ & ________________ for sole reason that it happens to be within range of your weapon. ...and wondering why the weekends can't be used on the next week's proposal. You also may want to revisit 3 & 4, I have already given my views on 3, but 4 is very anti-intuitive. Everyone knows that you pay top dollar for something that is "a quality attraction with an impressive and fresh experience" as well as a "record breaker". And I think few people are really in tune with the massive amounts of cash money that are used to build even a crap-tastic attraction, much less a record breaker. It is the reason why Six Flags went bankrupt...and therefore, Six Flags knows better than anyone just how much a record breaker is going to cost. And, also, this is Theme Park Apprentice, not Amusement Park Apprentice...the key should be that we need to theme something...and we all know that theming is the reason why Disney's Magic Carpet off the shelf carnival ride that would cost Six Flags $600,000 cost the Disney company $60 million. Juan, in case you haven't found them yet, the results for Challenge 1 were posted in the challenge thread. We will try to get results posted as soon as possible once all three judges have submitted their scores. 1. Use a proprietary ride system. You may use any commercially available ride system, from a basic Sally shooter to the motion base vehicles used on Justice League. You may not, however, use robotic arms, EMVs, Disney's trackless system, or anything of that sort. 2. Use a large number of complex animatronics. If you want to include one or two, that is fine. If you want to use an animatronic heavy ride, that is fine as long as the animatronics are relatively simple (see the challenge thread for a definition). However, using a lot of complex animatronics would not be advisable. Think about the difference between the animatronics on the Calico Mine Ride and the animatronics on Pirates of the Caribbean. Your attraction should lean more toward the former. 3. Use outside IP. Cedar Fair is not known for purchasing a lot of IP, so your attraction should avoid doing that. You can draw upon the history of your selected park and revive a past attraction for a modern audience. You can create your own story about something related to the park. You can ignore the park and just create a ride using invented characters that fits the theme of the park or the theme of the area in which it is located. However, you may not say "Cedar Fair has purchased the theme park rights to X." 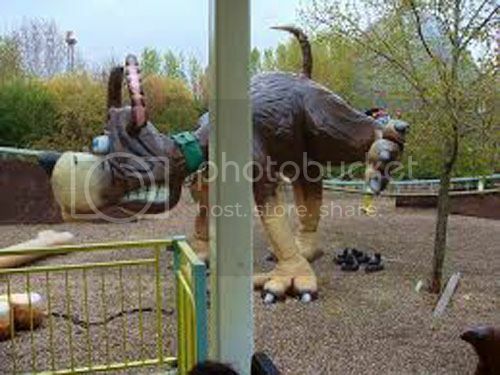 If you absolutely must use IP, you may do something themed to Peanuts or Dinosaurs Alive. Other than this, you can do pretty much whatever you want. Interactive or not, 3D or practical sets, use whatever seems best. If you want a quality reference, look at Cedar Fair's recent projects (Voyage to the Iron Reef, Wonder Mountain's Guardian, Calico Mine Ride) as well as the dark rides in the Six Flags chain (Justice League, Monster Mansion, Yosemite Sam and the Gold River Adventure) and other independent dark rides (Blazing Fury, Fire in the Hole, Flooded Mine, Challenge of Mondor, Mine of Lost Souls, Gobbler Getaway). We are looking more for a quality ride experience that is enjoyable to ride than a totally immersive attraction. Jeff, the idea behind these challenges is to design something that best fits the challenge requirements, not necessarily give every park something that would belong at a destination park. There is a difference between a regional park, such as a Cedar Fair or Six Flags property, and a destination park, such as Disney or Universal. Not every attraction needs to be a fully immersive experience. In fact, if you think about what Disney used to do with dark rides compared to what Cedar Fair, Six Flags, and other companies are doing with them currently, there isn't a whole lot of difference. Voyage to the Iron Reef and the Calico Mine Ride have just as much story as Haunted Mansion or Pirates of the Caribbean. In the last challenge, the primary goal was that the attraction needs to be enjoyable for children in the 3-12 age range. While the Gyrosphere would be a very enjoyable attraction, many kids would have just as much fun playing laser tag bumper cars, and for a park without the budget of Disney or Universal the latter is much more affordable. In this challenge, the two main goals are to make a quality themed attraction and make it enjoyable. That's it. There's no need to make guests feel like they've exited the theme park and stepped into another world, they just need to have a fun time for the duration of the experience. I know many members of this site are heavily skewed toward destination parks, but having visited over 70 parks myself, I've found that I often have just as much fun (if not more) at the regional parks. As for future challenges, we are currently working on tweaks to Challenge 3 and especially Challenge 4. I have already discussed Challenge 3, but for Challenge 4 you will have to design a roller coaster that both has quality theming and a unique ride experience. Think about this: Every Six Flags roller coaster built since 2006 has cost less than $15,000,000. A fair number of those attractions broke a record or contained a world's first element. Some of them are among the best roller coasters ever built. A few of them actually have really good theming by the standards of Six Flags, and the reality is that the more intense the roller coaster the less detailed the theming needs to be. It should be there, but you don't need to build an entire landscape around the ride when guests are being thrilled. Not every coaster needs to be a giant B&M Giga or an Intamin with superlatives in order to be an outstanding thrill ride. As for weekends, all challenges will be posted shortly after the results for the previous challenge are in. This will typically be on Sunday evenings. We want to allow a fair amount of time for the challenges and this timeframe is consistent with that used in previous seasons of Theme Park Apprentice. So this vague notion of what is scary and what is not scary is going to decide who has the best attraction and who has the worst...? Again, the idea is not that you can't include elements that could scare guests. The idea is simply that we don't want a ride-through Haunt maze. For example, a ride where guests are exploring a mountain but then run into a group of goblins and have to escape is fine. A ride where guests are slowly moving through an abandoned warehouse, turn a corner, and are immediately assaulted by a serial killer is not. If you want another criteria, think about it like this...would I take a 2nd grader on this ride? If the answer is no, it's probably too scary to be considered family friendly. In terms of movie ratings, PG is absolutely fine. PG-13...maybe, depending on how realistic the content is (fantasy elements tend to be less frightening than real things). Something that would warrant an R rating should definitely be avoided. Height restrictions are mostly determined by the ride system, but I would personally consider a family ride to be no higher than 42" minimum if accompanied. Also, remember that you are NOT required to make this a shooting ride. You may do so if you wish (and those seem to be popular right now), but if you feel your attraction works better as a non-interactive dark ride than feel free to do that. Hello everyone! I’m Karina, and I’m so honored to be a part of such creative community of individuals. I would also like to sincerely thank the judges for their time and effort in writing and publishing the challenges, writing constructive critiques, judging the competitors, and providing answers to the questions. While I believe that it’s critical to know the qualities of an attractive theme park for an aspiring Theme Park Apprentice, I also believe that it’s important to know what would make a theme park much less desirable. I propose that, after the final competition, an optional challenge should be made for all participants (the eliminated and the victorious) in which they would create an attraction, ride, show, themed land, or park (at the judges’ discretion) that would be ridiculously terrible. While I may have some decent ideas for the challenges, I will also admit have some ideas that are so hilariously bad. I’ve thoroughly read all of your proposals, and I know that many of you really like incorporating humor, and this would be the perfect opportunity to do so (with appropriate and safe limits of course). I also think that this would be a great opportunity for interested participants to be involved in the competition until the finale, and the remaining competitors would certainly appreciate their feedback or support. I would like some feedback on this idea, or any other suggestions for this proposed challenge. Of course, the final decision rests with the judges, who would design the optional challenge for all the competitors and ultimately have the final say in the rulings and components of this amazing competition. Thank you! What an interesting idea! Over the years I've read (and possibly written) some proposals that might qualify for this, but I don't think they were written to be intentionally bad. I don't know if I'm more intrigued or terrified with what might be produced if written to be intentionally bad. This is something to be seriously considered after TPA7 is over, but it could be lots of fun. I can think of about 5 times that I wrote intentionally bad proposals that were hilarious....remember Zombie Jeff? Or the Fractured Fairy Tale with the whole thing written phonetically? Even my Southpark Theme Park from Tournament of Champions was supposed to be more funny than a serious contender. I also had a robot at one point that referred to all humans and guests in the park as meatbags. The problem with most of these is that Robert Niles occasionally goes back over the user id's and purges out ones that he knows are fake, which are usually not that hard to find...but it also deletes the funny posts associated with them. I would really like to read some of those posts if we could get Robert to find them in the official archive for us. Karina, while having a bad attraction round during the competition wouldn't happen, having one as a bonus challenge after the conclusion is definitely a possibility provided there is enough interest. We would probably limit it to an attraction (ride, show, or walkthrough), as those are easier to judge, and require that the presented attraction be realistic (no bad attractions due to a serious risk of major injury or death), but other than that it would likely be pretty open. It would be fun to see what people submitted, as it's not too hard to make a bad attraction, but it is a challenge to intentionally dream up the worst possible attraction you can think of. Also, for anyone who has been eliminated but would like to continue playing the game, or for anyone who is not a competitor but has an idea for a particular challenge, we have decided to open up an unofficial submission thread. This will be a place for non-competitors to post proposals and receive feedback on their work without committing to participation on a full season. While the official judges will not be critiquing unofficial proposals, we have recruited a guest judge to do so: Blake Meredith, the Champion of Theme Park Apprentice 6.1. If you are thinking of potentially competing in the future, this is a great opportunity to try out the game, get some input, and decide if it is something you want to commit to or not. OK, so I have a quick question about Wonder Mountain's Guardian. Why is it disliked to much? I've been on Voyage to the Iron Reef and loved it, and Guardian seems pretty similar. However a lot of people seem to hate on it. What about this ride makes people dislike it? 1. Lack of theming. The inside of the attraction is literally just one long screen with no set decoration at all. No attempt was made to make riders feel like they are actually inside the mountain. 2. Length. The roller coaster section of the ride consists of only one drop and a couple turns. This is followed by a dark ride section that only lasts about 90 seconds. As a result, the ride somewhat fails both as a roller coaster and as a dark ride. 3. Capacity. The theoretical capacity of the ride is 650 riders per hour, with the actual capacity typically being somewhere in the 500s if all trains are running. Canada's Wonderland is the most heavily attended seasonal theme park in North America, seeing over 3.5 million visitors per year, so Wonder Mountain's Guardian routinely posts 90+ minute waits and Fast Lane is not available. Now, according to friends who have ridden the ride it is not terrible, but is more in the average category. Most have said it's worth doing once, but probably not worth a re-ride unless the line is short. The reason reception of Voyage to the Iron Reef is so much better is because Cedar Fair improved on two of the three main faults that Wonder Mountain's Guardian had. Voyage to the Iron Reef has excellent theming (I'd put it on par with the best D tickets at Disney) and by getting rid of the coaster element and just making a 4 minute dark ride the overall experience is much better. Capacity is still an issue (800 riders per hour theoretical), but even with constant 60+ minute waits most visitors are coming off satisfied. I would disagree with AJ, and I have been on Wonder Mountain's Guardian. I think the biggest problem with WMG is the length of the queue. I got onto the ride first thing after rope drop, walked through the queue and all of the way to the station before I had people in front of me. With very little queue I thought the ride was pretty good, but when I saw that the queue was 90 minutes I knew there was no way that I was going to wait that long to go again. The roller coaster elements were a requirement since there is not much room inside the mountain. There needed to be some kind of lift on the outside of the mountain to lift the vehicles to the second story, right above the loading station, and a roller coaster seemed to make the most sense, considering there was a lot of hardware to tote around as well. This also allowed them to put a special element at the climate to get the cars back with to the level of the loading platform. There is not much to the roller coaster aspect since it is used only as a conveyance. I would equate this to the Pirates of the Caribbean having a 2 hour wait. Good ride, but not worth 2 hours of my time to ride it. If PotC has a 10 minute wait, I could happily ride it all day. I've also ridden WMG. True, there is no interior theming, but since you spend the entire time inside the mountain shooting at various attacking monsters you really don't have time to check out the scenery. Jeff is correct in that the coaster portion is really just a way to move the cars up into the mountain to where they were able to fit the ride. There were two or three other attractions already located in the mountain, and I think they did a pretty good job of shoehorning WMG inside it. Do I wish it had been longer? Yes, because by the time I really figured out how to aim and hit the attackers the ride was over. The drop track at the end was pretty thrilling- never been on one before. I hope that CF learns from their efforts, mistakes, etc. and as more dark rides begin to appear they are superior to their predecessors. WMG could have been better, but considering what they had to work with it was a pretty good ride. There has been some discussion from both competitors and judges that one week may not be an adequate amount of time due to the complexity of challenges in Theme Park Apprentice 7. Additionally, due to the current posting schedule those who are busy during the week and must work on proposals during weekends have very limited time to do so. Therefore, we are going to be tweaking the challenge posting schedule. Beginning with Challenge 3, challenges will be posted on Friday evenings in order to allow a full 8 days for competitors to create a proposal. However, we have also discussed extending the timeline further to allow a full two weeks to write proposals. While this would allow more time to work, it would also result in a significant overlap and competitors would be responsible for ensuring that each proposal is submitted by the deadline. In addition, it is possible someone could put a large amount of work into a proposal only to be eliminated and never get to post it. As I am guessing some would prefer to only think about one challenge at a time and others would like to have the extra time to work at the risk of being eliminated part way through proposal creation, the most fair way to decide what to do is a vote. If you would prefer a full two weeks or prefer that we don't post overlapping challenges, please state your opinion here. Posting the challenges on Friday is a good idea. Overall I'm good for whatever. Posting the full requirements of the next challenge on Friday evenings is great! However, I don't think that extending to two weeks would be beneficial, as I would personally prefer to only be worried about one challenge at a time. Elimination would also be devastating to anyone who spent a lot of time on a single proposal. Since earlier challenge postings are going to be implemented, I think it'd be best to postpone any further changes to the schedule until this has been going on for a few weeks. Depending on the response from both competitors and judges, a two week window or another option can always be reconsidered later. I think that posting the full challenges on Friday is a splendid idea, because it gives us additional time to conceive and develop our proposals. It's also a good time to start working on the next week's proposal, because many of us have already finished most or all of our previous proposal and might be eager to start on the next one. However, I don't think that extending the proposal deadline to a period of two weeks is a good idea for the reasons that Andrew mentioned. I also think the judges will receive higher quality proposals when the participants have the chance to focus their attention on a single proposal during the week. So, I have a question. What would you call a "typical" dark ride vehicle, such as those used at WDW in "Winnie the Pooh" or the old Snow White Ride? I can picture it, I just don't know what it's called. Thanks! DPCC, I see that you already submitted your proposal. While Disney has creative names for them (honey pots, mine carts, etc.) I would just call the vehicles you describe dark ride cars. The vehicles are simple so we shouldn't have any problem figuring out what you're going for. Thanks for the helpful feedback guys! Yes, Crystal Caverns was intended to use the entrance of the Crypt, but I was looking at park maps and could not find the building. I was worried that the building had been either removed or repurposed, but it would be a perfect place and cut down costs even further. James, the mining claws are basically your standard "blaster" for a shooter dark ride. You pull back a string on a physical "claw", and a virtual projectile launches to gather the crystal. In hindsight, it might have been better to leave the name as blaster or something similar to avoid confusion. Thanks, Andy. I had something in my mind like the claws that lower into a pit and grab a toy in a vending machine game, but you also mentioned something about a claw on a wooden dowel and pulling a string like in TSMM and I was completely confused. I still don't understand how it would work on the solid crystals. You're right- using descriptive, easily understandable and small words sometimes is the best way to describe something complicated. As far as the map goes, Cedar Fair likes to leave unused and backstage buildings off of their maps. Since Crypt at KI is closed, it doesn't exist on the current map. James, I know your rulings are final, but I just wanted you to know that this ride does not actually happen underground, but is rather themed as though it is. Also, guests should assume The Thinking Machine was not really "dead" after all, despite what DC told them. Wow, I am quite surprised by how well I did in the last round, especially after AJ tore me a new wormhole! Jeff, your totally original carousel shooter deserved it. Honestly, all of my fellow competitors are exceptional, and it's shocking to see someone as strong as Karina ousted (but only for now, it seems, redemption round willing). For all the judges' diverging opinions, you were all astute to highlight the plot holes in my time travel "story." I tried a few approaches to solve those paradoxes, but nothing seemed simple enough to convey in the context of a dark ride. Know that I take all of your advice to heart, and I greatly appreciate the time it takes you to critique all of our entries. This game is a lot of fun! DPCC, I don't mind you clarifying concerns that I mentioned in my critique at all. Even though I can't make any changes, it still helps me to understand your proposal and eventually your entire body of work. Not that judging is easy, but it's a little bit harder to compete, isn't it? ;+) I'm glad to see you getting experience on both sides of the fence. Douglas, I'm still trying to figure out how you do such complete proposals so quickly? Are you, like, in jail, in solitary confinement 23 hours a day, with nothing to do but write? I'M JUST KIDDING! But really, you do such good work so quickly, graphics and all. As far as this game being fun, I've been doing TPA and its various versions of it since Water Park Apprentice in June, 2010! It does get a bit addictive. I'm surprised I'm getting this far in the competition, and it's only Challenge 3! Tyler, your work has improved greatly since TPA5 (which was 2 years ago if you can imagine that!). I don't know your age nor do I need to, but your writing technique has improved and a combination of experience and what I perceive to be maturity definitely shows. Work hard, plan carefully, be critical of you own work and present proposals that you know are the best you can do and you'll do fine. In the last competition, TPA 6.1 (where I played under a pseudonym Scott E.) I got cocky and thought I'd just start out and show these "kids" how to do it- and I started out nearly at the bottom. I realized I needed to get my act together, worked hard and I ended up in the finals. So can you, with continued hard work and dedication, and by learning from mistakes (yours and others) and making every proposal you do better than the last one. Hard work and experience- do the first and learn from the second. James, you'll be thrilled to know that the prison granted me extended access to the computer lab this morning, so I've now posted for Challenge 3. Now it's time to go out in the yard and debate Universal vs. Disney with my fellow convicts. LOL! I just read your proposal and wrote my critique, and I was actually wondering if you were going to say anything like this! If I were you I'd side with the Universal gang- I think the Harry Potter's magic would beat Mickey and his Sorcerer's Apprentice magic hands down. BTW, I had never heard of DelGrosso's Amusement Park before and had to look it up. Wow! It IS small! Things are tough here in Theme Park Prison. Once I saw a guy shivved with a sharpened Harry Potter wand, all for defending Avatar. You pretty much have to pick a side on your first night. Universal’s gang, the Minions, are really good at getting things done quickly. Disney’s gang, the Elsas, have put most of their recent efforts into schmoozing the Asian convicts. There’s also a small but aggressive band of Cedar Fair boosters, known as the Koehls. Both the Disney and Universal gangs have been working on “breakthrough” escape plans recently, although Disney’s plan isn’t expected to be ready until 2021. Besides, they recently spent most of their cigarettes on a foolish program to track guards’ movements. Thanks, Douglas. It's 3:41 a.m. where I am, and I'm getting ready for work and I just spit my yogurt all over my screen! That was probably the funniest thing I'll read all day! Hey everyone! I wanted to thank you (especially the judges) for their time and commitment to this competition. I really enjoyed every aspect of it, and I loved reading other contestants' proposals. I wanted to clarify something. By using the term "Indian" in my Challenge 2 proposal, I really did not mean to offend anyone, including Native Americans as well as Indians. The term "Indians" was not deemed officially politically incorrect until the 1940's, much before the exploration of the California coast as depicted in my dark ride. I was just trying to be colloquial to that time period, to set guests within that time frame. I now realize that I should have changed it to something else, probably even more politically correct than "Native American" (at which some still seem to take offense). I'm sincerely sorry about that, and basically my entire proposal. It really was a huge mess, and I could have done much, much better. Anyways, I had an idea for Challenge 3 that I really liked. I thought that I wouldn't let it go to waste, so I have written it out and posted it in the Unofficial Submission Thread (without my painstaking graphics that I'm so thankful some of you previously liked). If you do get the chance to see it, I hope you like it! I had a couple of problems, including my park, and I finally decided on one that is currently in construction (though I'm not sure that officially would qualify). Finding an authentic menu was MUCH harder than I had originally imagined, but I had loads of fun doing it. I can't wait to see what the judge has to say in a response. Anyways, thank you all for everything! I'll definitely be competing in the Redemption Round. I know the specific challenge hasn't been released yet, but I wanted to ask a couple of questions. First, is the redemption round a separate challenge during Challenge 5 just for eliminated competitors, and the 1st place winner would earn a spot back into the competition? Second, will there be any cumulative elimination (secondary eliminations) after the Redemption Round (or Challenge 5)? If so, I think the winner of that round would be at a considerable disadvantage since they haven't been participating in all of the challenges, opportunities to gain points. Again, thank you all for everything and I'll still be following this addicting competition nevertheless! I think at the moment the plan is to use the redemption draft that I've written (and occasionally change and update), unless of course we get a better idea :P.
Yes, it is a completely unique challenge separate from the main competition. Competitors are welcome to submit "unofficial" entries (and I hope you all do, obviously I can't go into detail, but I can say it has some challenges that will require a creative solution...). >>>If so, I think the winner of that round would be at a considerable disadvantage since they haven't been participating in all of the challenges, opportunities to gain points. I think the impact of the cummulative points system wont be too large, My understanding (as I read back through the rules is that the points are used for a second elimination. As long as we don't eliminate a second, I don't see them coming into play. However, as the master of the points, it might be best for AJ to handle that one. Karina, I'm very glad you enjoyed playing Theme Park Apprentice. I wish you the best of luck in the upcoming redemption round, and hope that in any event you will continue following the competition and consider competing again in the future. Feel free to submit any ideas you have in the unofficial submission thread, and even if I may not have time to write a critique for them I'll definitely read everything (you should still receive critiques from Blake). In regards to your questions about the redemption round, Challenge 5 is a two week challenge. The redemption round will occur during the first week of that challenge, then the redeemed competitor will be required to submit a proposal for Challenge 5. Any competitor is welcome to submit a proposal in the redemption round for a critique from the judges, but only eliminated competitors will receive any prize in the challenge. The winner of the redemption challenge will be readmitted to the competition and they will receive enough points to remain competitive. While we haven't decided for sure how many points this will be, they will either have their point total set equal to the lowest remaining competitor or (more likely) will receive a flat amount of points (probably 15, though it could change) for each challenge they were absent from. There will not be a double elimination following Challenge 5, but there may be one following Challenge 6 depending on how many competitors we decide to admit to the final and whether anyone drops between now and then. My proposal should be coming in 2-5 hours time.. if I remember to do it..
Will the details of Challenge 4 be posted tonight? Sorry for the delays with posting Challenge 4. I am currently making some last minute edits. The challenge should be up by 11 PM. Thanks for the heads up, Jeff. I believe Andy is the only one who has yet to post. As always, if a proposal is delayed due to circumstances beyond a competitor's control, we will not assess any kind of late penalty. This might be the most competitive series of proposals in Theme Park Apprentice history. Everybody did amazingly well, and doesn't deserve to be eliminated. To all my fellow competitors, amazing work! It's a joy to wake up in the morning and read a proposal as ornate and imaginative as Andy's. Chad, I hope you fulfill your promised restaurant proposal. And with Round 3 over, I feel safe in revealing that my original plan was to plop a restaurant down in Knott's. Their wonderful Boysenberry Festival made that too obvious, though, so I'm afraid all my research last week pigging out on berry recipes was for nothing! I think it could have used a little more work, by no means the best restaurant I've designed for TPA (I'll always have a soft spot for Unplugged: Acoustic cuisine), but I thought it was looney enough to throw my hand in.. I must second Douglas' good wishes...happy anniversary James! Chad and James, thanks for both of your great critiques. Of course, I always feel the need to clarify anything that was a little confusing in my proposal, even though it's too late to change your rankings. The touchscreen tables have actually been implemented at several restaurants worldwide, but are yet to make a debut in the U.S. Although I have yet to try one, the initial reviews seem overwhelming positive. Also, as far as the gear coaster/placemat virtual display, it was not meant to replace a coaster or placemat, but rather to supplement it as an additional design component. It would be no harder to clean than your normal foodcourt table, as the surface itself is similar to plexiglass. Chad, quick question: did you order your critiques based on your personal rankings? It seems so, based on the feedback, but I just wanted to make sure. To all the contestants, this is certainly a nail-biting round. I read through everyone's proposal, and I can envision all of them as fully functioning restaurants. Great work! >>>>Chad, quick question: did you order your critiques based on your personal rankings? It seems so, based on the feedback, but I just wanted to make sure. No, its just when I accessed the page to do my judging it only had the bottom half of the entries. I didn't realize was missing half until I was 2-3 in. Thanks for the good wishes! I've never heard of the touch screens- if they work, they work, and it would be a great addition to the restaurant. And there is nothing wrong with explaining something that we didn't understand in your proposal. Seeing what we didn't understand or misunderstood could be something to remember in future proposals. As far as how I rank my critiques, I do in in order they are posted. It is expensive now, but to our children this will be common-place and being handed a written menu will be something quaint and old-fashioned. We interrupt this chatter thread for counterfeit money advertising..
My god, what has this website fallen to? I just thought it was a really terrible restaurant proposal. I already hit the Spam button. We must be hitting the big time! Hey, I just thought of a great challenge for the suggested bad proposal contest- a Spam-based restaurant, where you can make no reference to Monty Python! You have to admit, Robert does respond quickly to spam like that- well done, sir! Thanks to everyone who reports spam on the boards -- it helps us to delete it quickly, which in turn makes us a much less desirable target for that sort of thing. All that said, the spam restaurant is an easy fit for a "Hawaiian Diner" theme. Put it next to a Tiki bar, and watch the money roll in. It works very much like a Brazilian BBQ; food keeps on pouring in only as long as diners are willing to forfeit sensitive personal information. Your mother's maiden name may be exchanged for an appetizer. Current mailing address yields a salad. For our hungriest patrons, a perfectly seared Rib Eye will cost you your social security number. This restaurant is expected to be exceedingly profitable. So Robert, with a winning proposal like that would you please tell us why you're not competing in Theme Park Apprentice? Although I have to admit that Douglas' proposal for Feed the Trolls is pretty good. I just hope that Six Flags doesn't catch wind of it! "1. You may use any type of coaster that does not exist in your chosen Six Flags park." For the definition of this rule, we will go with same make and model. A similar style ride by a different manufacturer would be okay, but not the same style by the same manufacturer. For example, you could give a park with a PTC woodie a GCI woodie, but you could not give a park with a GCI woodie a second GCI woodie (even if one is an out-and-back and the other is a twister). When it comes to RMC, you can give a park with an I-box conversion a new Topper Track woodie, but you could not give them a second I-box (even one built from the ground up). The only thing I will caution you about when it comes to statistics and layout is to make your new attraction different enough that it wouldn't be viewed as redundant. For example, adding a GCI out and back to a park that already has a PTC out and back wouldn't be a good idea, but adding a GCI twister could work well. Yep, I have posted my redemption challenge proposal, and it's quite the experience. 1. Save the image files to your computer. 2. Create a free account on Flickr (or another photo hosting site) and upload the images there. 3. Use the share link on each image to get a HTML code that can be pasted directly into your proposal instead of the links. Make sure the display is no larger than 500 pixels wide (there should be an option to set this at the share link). While not required, this will give your proposal a much cleaner look and an aesthetically pleasing proposal is guaranteed to make a better impression. Thanks for telling me this AJ. I will check the links again to make sure every one of them works, and I will take your advice and use them in the future. UPDATE: Okay, the links should be working, I found a server problem with the second link. It's all fixed now.